It's been about 18 Months since I build a NAS for my own use and over time, my requirements have changed drastically. For one, I went with Windows instead of OpenBSD because I wanted to run some Windows-only software, and because NTFS works for backing up other NTFS Volumes, like my Home PCs. I've been using Backup4All Pro to backup the server to another external storage (a 3 TB Apple Time Capsule), including AES-256 Encryption. Number 1 would've been an easy fix, just get a different case, but - despite varying opinions - I want ECC RAM in my file server, and that required a new mainboard & CPU. ECC RAM in the Intel world requires a workstation chipset (like the C232 or C236) and ECC supporting CPU, which would be a Pentium or Xeon. The Core i3/i5/i7 CPUs do not support ECC even though the lowly Pentium does, presumably to not cannibalize the Xeon E3 market. After all, the only real difference between a Xeon E3 and a Core i7 is ECC RAM support. 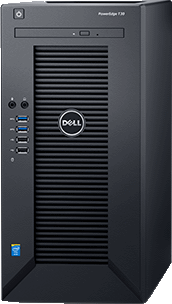 After looking around and pricing a CPU + Mainboard + ECC RAM Combo, I stumbled upon the Dell PowerEdge T30 tower server, which at least right now is on sale for $199 for the Pentium G4400/4GB ECC and $349 for the Xeon E3-1225 v5/8 GB non-ECC version, with coupon codes 199T30 and 349T30 (Update: These seem expired now). $199 definitely beats anything I can price together for a Case + Board + CPU + ECC RAM, so I ended up buying one as my new file server. 1x 4 GB DDR4-2133 ECC RAM - there are 4 slots, supporting a maximum of 64 GB. Dual-Channel, so with only 1 DIMM it's a bit of a waste. Undocumented M.2 2280 SSD Slot - requires PCI Express M.2 SSD, can't use SATA/AHCI. 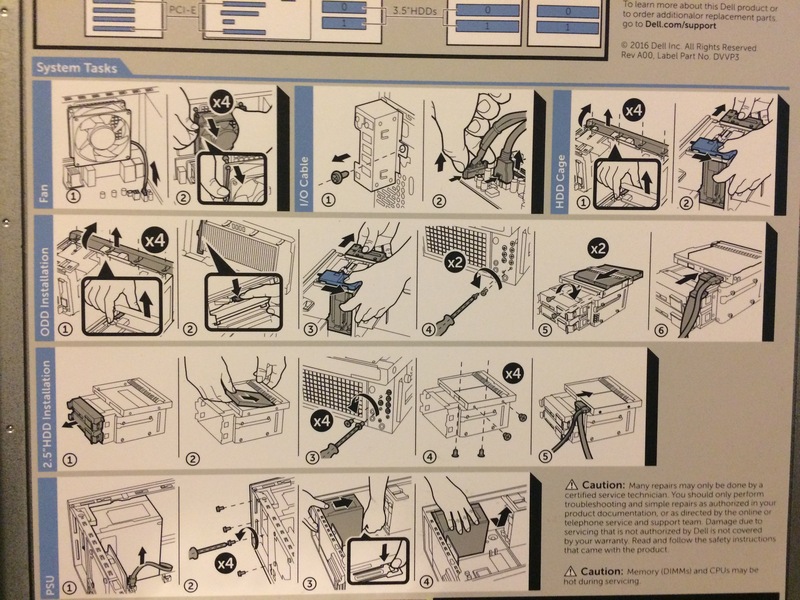 So that's an extra $140 for a $199 server, but I couldn't have built anything better for $340. The server supports up to 6 hard drives, with 4x 3.5" and 2x 2.5" slots. Instead of 2x 2.5" drives, a slim laptop optical drive can be installed. However, there are only 4 SATA ports on the mainboard (Intel RST, supports RAID), and by default only power cables for 4 drives as well (2 for the bottom, 2 for the top). That's why I ended up buying a cheap 2-Port SATA controller and a SATA power splitter cable. One interesting tidbit is that the hard drive is using 512e sectors, that means that even though internally the drive uses 4K Advanced Format, the system actually sees a drive with old-school 512 Byte Sectors. This can help with compatibility issues, because some systems (e.g., VMWare ESXi/vSphere) don't support 4K Sector drives. Since Dell doesn't specify the type of drive you get, there might be other drives as well, but I think that 512e sectors makes sense for a server that's without an operating system. Since I don't run VMWare and since my other data drives are 4K Sectors, the OS Drive being 512e doesn't matter to me. 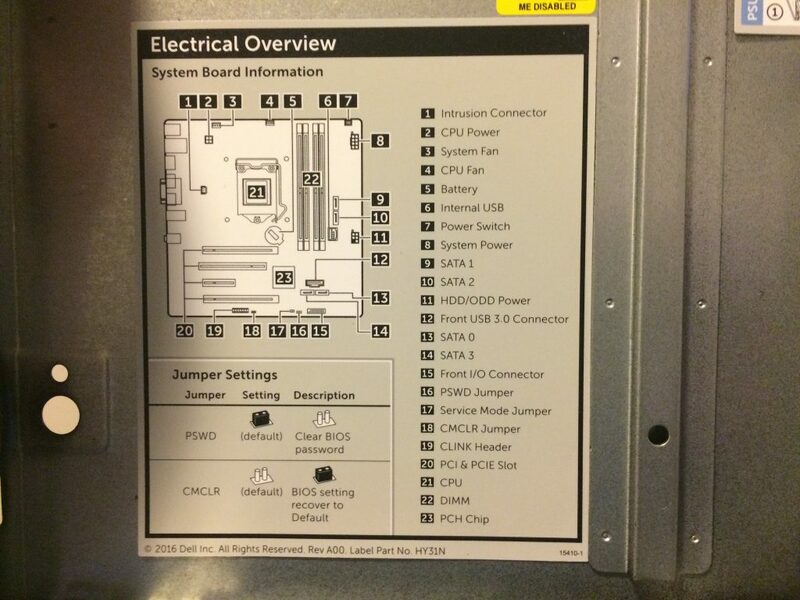 There is an undocumented M.2 Slot on the mainboard. Actually, there are two, one in the rear of the case that's not actually provisioned (no slot on the board, but the soldering points are there) and one M.2 Slot in the bottom right under the RAMs, that is actually provisioned and working - until BIOS 1.0.3 (and 1.0.5 as well). I get 900 MB/s reading from the 128 GB Samsung PM951, and it's possible to boot off it. at least until BIOS 1.0.2, which is what I'm running. I reached out to Dell to ask them to reconsider disabling the slot - it's undocumented, but it works. I don't know if the comparatively low speed is because the PM951 is slow or if the M.2 Slot is only connected to 2 PCIe Lanes, but I'd take a 2-Lane M.2 slot over no slot. Update July 2017: BIOS 1.0.5 fixed the Intel Management Engine remote exploit, which you absolutely must have if you have a Xeon. But that also means no M.2 Slot, and it's highly unlikely that Dell will enable it back. I haven't set it all up yet, but the idea is to have a multi-stage backup. First off, local machines on my network just store files on the server or regularly backup onto the 3 TB drives using Windows Backup. For the data on the Server, I use Backup4All Pro to create an AES-encrypted backup to an external drive. For the longest time, this used to be an Apple Time Capsule, but that thing only supports SMB1, which is horribly broken and insecure, so that's no longer an option. Since I still have my old server (it's becoming a service box since I want to keep this file server here as clean as possible), I think I'm going to move the drive from the Time Capsule into it. That gives me several levels of protection locally, but I'm also planning to archive to Amazon Glacier. Backup4All supports backing up to Amazon S3, and it's possible to have S3 archive to Glacier, which makes this a good option. If you set the "Transition to Glacier" value to 0, it immediately goes to Glacier and no S3 storage fees apply - only transfer fees. Once the entire Backup system is up and running, I'll create a separate post. Now, there are some thing to be aware of. First off, the 290W power supply has exactly two power cables, which both go into the mainboard. From the mainboard, there are exactly 4 SATA Power Connectors (unless you order the SATA Power Extension for an extra $20), which is exactly what you need for the 4 SATA ports on the mainboard. Extensibility is really limited: If you were thinking of adding a powerful GPU, you won't have the 6 pin connector to drive it. If you want to add more hard drives (the case holds 4x 3.5" and 2x 2.5" drives), you'll need either Dell's SATA Power Extension (which they don't seem to sell separately) or a third party one that hopefully doesn't catch fire. The C236 chipset supports Kaby Lake, so it should be possible to e.g., upgrade to a Pentium G4600 and get HyperThreading, or to a Skylake-based or Kaby Lake-based Xeon E3, assuming Dell doesn't have any weird BIOS limits in place. 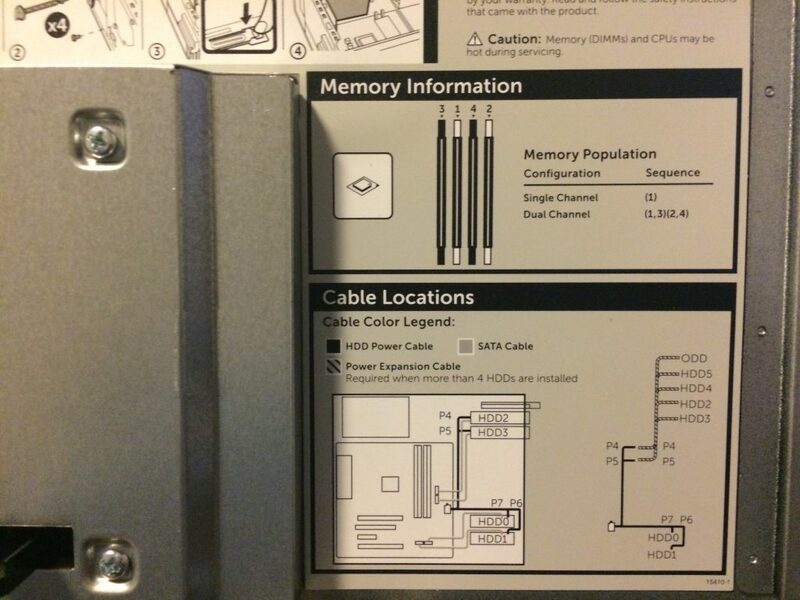 Memory-wise, there are 4 DIMM slots in 2 Channels, which currently mean up to 64 GB DDR4 RAM. 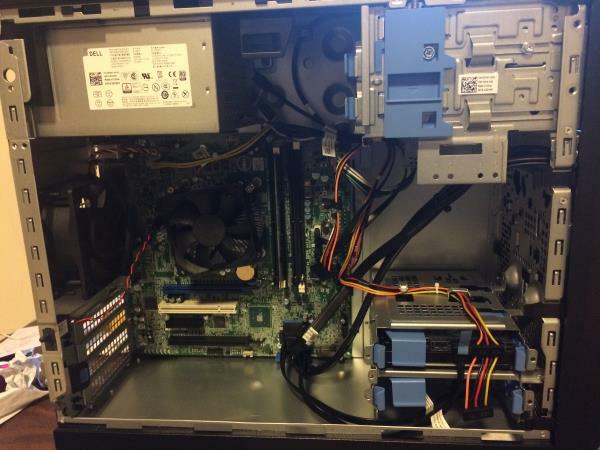 It's an entry-level server. It was reasonably priced, has ECC RAM, is really quiet, and does what I need. I like it. A couple of years ago, I created a simple .net Library to create Excel .xlsx sheets without the need to do any COM Interop or similar nonsense, so that it can be used on a web server. I just pushed a major new version, Simplexcel 2.0.0 to NuGet. This is now targeting both .net Framework 4.5+ and .NET Standard 1.3+, which means it can now also be used in Cross-Platform applications, or ASP.net Core. There are a few breaking changes, most notably the new Simplexcel.Color struct that is used instead of System.Drawing.Color and the change of CompressionLevel from an enum to a bool, but in general, this should be a very simple upgrade. Unless you still need to target .net Framework 4 instead of 4.5+, stay on Version 1.0.5 for that. RAM and CPU Cycles are there to be used. Answer: The white area in the top of the CPU and Memory graphs. These indicate that I spent money on something that I'm not using. One of the complaints that are often brought forward how certain applications (especially browsers) are "memory hogs". As I'm writing this, Chrome uses 238.1 MB of RAM, and a separate Opera uses 129.8 MB. Oh my, remember when 4 MB were enough to run an entire operating system? Now, here's the thing about RAM and CPU Cycles: I spend my (or someone elses) hard earned cash on it in order to speed up my computer use. That's literally why it exists - to make stuff go faster, always. Having 32 GB of RAM cost about $200. In the above screenshot, about $135 of those hard earned dollars are just doing noting. It's like hiring (and paying) an employee full-time and only giving them 3 hours of work every day. That CPU? It's Quad-Core, Eight Thread, with 2.6 Billion Cycles per second - that's between 10 and 20 Billion total cycles each second. And yet, it's sitting at 16% in that screenshot. For a CPU that's priced at $378, that's $317 not being used. There are priorities and trade-offs that everyone needs to make. In a Laptop, maybe you don't want the CPU to be constantly close to 100%, because it drains the battery and the whirring cooling fan is annoying. But maybe you bought such a high end laptop specifically because you want to use that much CPU power and RAM. I certainly did. 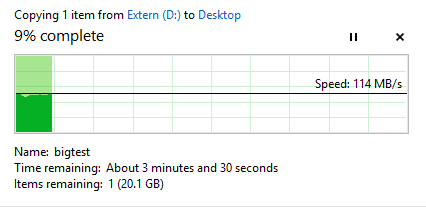 Two applications that I run that really make great use of my Computer are SQL Server and Hyper-V. SQL Server is currently sitting at 3.5 GB and will grow to whatever it needs. And Hyper-V will use whatever it needs as well. Both application also do respect my limits if I set them. But they don't prematurely limit themselves. Some people are complaining about Spotify's memory usage. Is that too much for a media player? Depends. I'm not using Spotify, but I use iTunes. Sometimes I just want to play a specific song or Album, or just browse an Artist to find something I'm in the mood for. Have you ever had an application where you scroll a long list and halfway through it lags because it has to load more data? Or where you search/filter and it takes a bit to display the results? I find that infuriating. My music library is only about ~16000 tracks - can I please trade some RAM to make the times that I do interact with it as quick as possible? YMMV, but for me, spending 500 MB on a background app for it to be super-responsive every time I interact with it would be a great tradeoff. Maybe for you, it's different, but for me, iTunes does stay fast at the expense of my computer resources. Yeah, some apps may take that too far, or do wrong behaviors like trashing your SSD. Some apps use too much RAM because they're coded inefficiently, or because there is an actual bug. It should always be a goal to reduce resource usage as much as possible. But that should just be one of the goals. Another goal should be to maximize performance and productivity. And when your application sees a machine with 8, 16 or even 32 GB RAM, it should maybe ask itself if it should just use some of that for productivity reasons. I'd certainly be willing to trade some of that white space in my task manager for productivity. And when I do need it for Hyper-V or SQL Server, then other apps can start treating RAM like it's some sort of scarce resource. Or when I want to be in battery-saver mode, prioritizing 8 hours of slow work over 4 hours of fast work. But right now, giving a couple of hundreds of megs to my Web Browsers and Productivity Apps is a great investment. Fast forward a few months and Dell has fixed it by releasing a new Dock, the TB16. I ordered the 240 Watt Version, Dell Part 452-BCNU. First observation is that the 240 Watt Power Supply is absolutely massive, but relatively flat. Not an issue since it's stationary anyway, but if you were considering carrying it around, think again. Also, one important note on the difference between USB-C and Thunderbolt 3. They both have the same connector, but Thunderbolt 3 is four times as fast as USB 3.1 Gen2 - 40 GBit/s compared to 10 GBit/s. This is important when driving two high resolution (4k @ 60 Hz) monitors and a bunch of other peripherals. There are plenty of USB-C docks out there, but not really many Thunderbolt 3 docks, hence it's so important that the TB16 finally arrived. Update: On the Dell XPS 15 laptop (9550 and 9560), the Thunderbolt 3 port is only connected via two instead of four PCI Express 3.0 lanes, thus limiting the maximum bandwidth to 20 GBit/s. If you were thinking of daisy chaining a potent graphics card (e.g., via a Razer Core) or a fast storage system, that port will be a bottleneck. Though it seems to be useable for 8K video editing, so YMMV. The promise of Thunderbolt is simple: One single cable from the Notebook to the Dock for absolutely everything. And that's exactly what it delivers. Let's look at the ports. 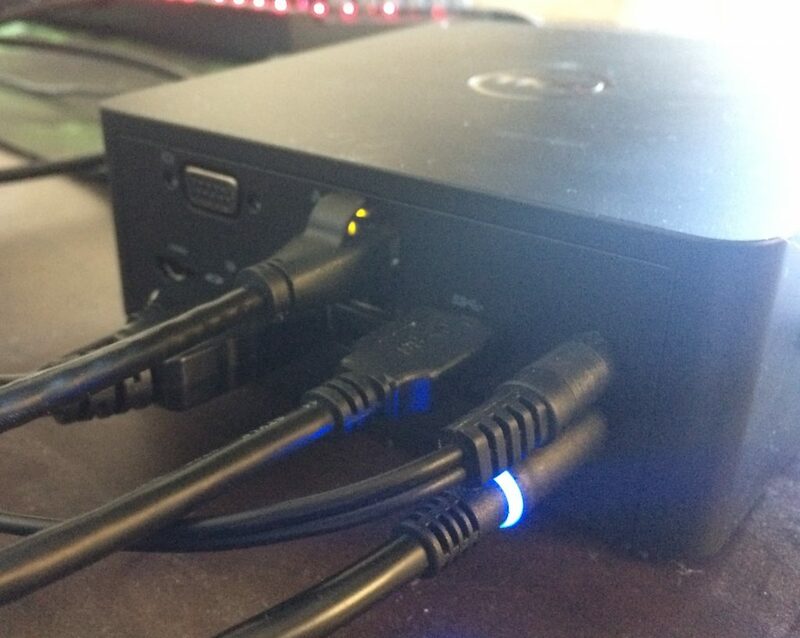 In the front, there are two USB 3.0 Superspeed ports, and a Headset jack that supports TRRS connections (Stereo Headset and Microphone), along with an indicator light if the laptop is charging. In the back, we have VGA, HDMI 1.4a, Mini and regular DisplayPort 1.2 for up to 4 external monitors. 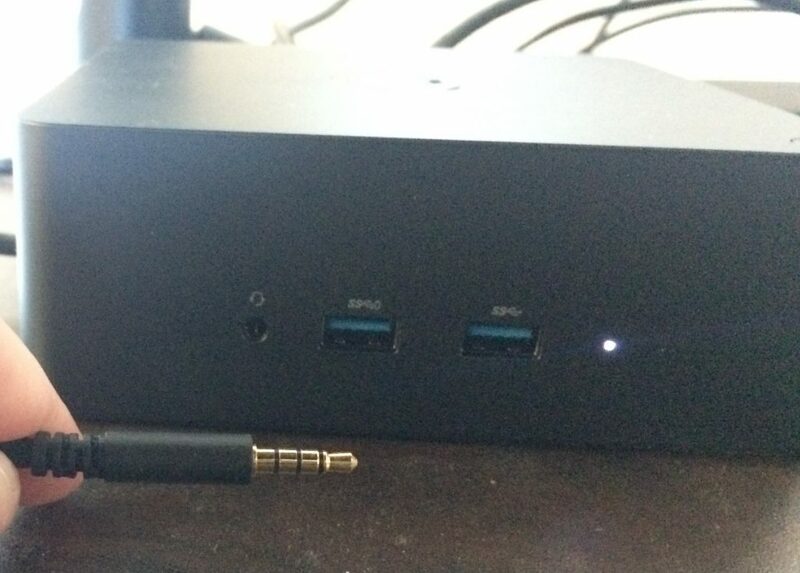 A Gigabit Ethernet port (technically a USB Ethernet card), Two regular USB 2.0 ports, one USB 3.0 Superspeed port, and a Thunderbolt 3 port for daisy chaining or usable as a regular USB-C port. And last but not least, a regular stereo audio jack for speakers and the power input for the 240 Watt power supply. Update: I played around with the monitor ports, and it seems that my XPS 15 9550 can only drive 3 monitors at any given time, so either internal Laptop Screen + 2 DP Monitors or 2 DP + 1 HDMI or 2 DP + 1 VGA monitor. 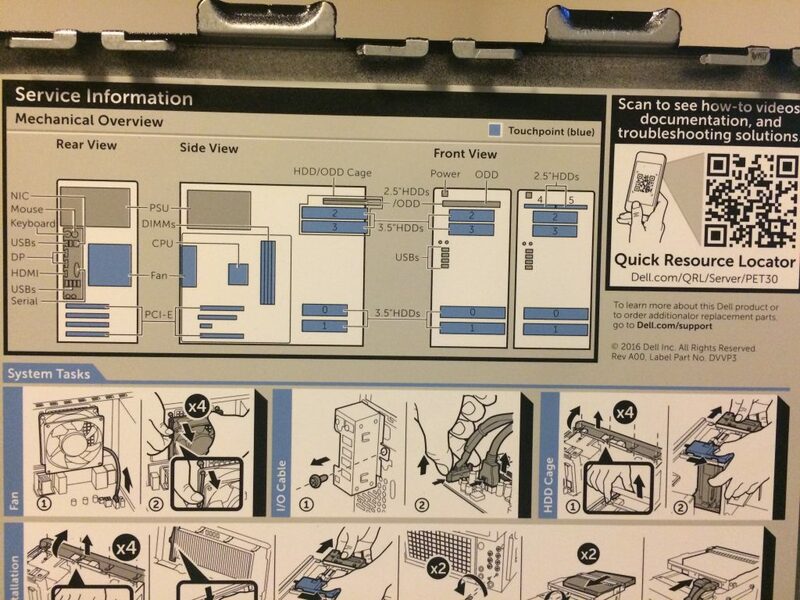 The User's Guide says that 3 or 4 monitor configurations should be possible (4 only without the laptop display). I haven't tried too much though, it seems that 3 monitors would require going down to 30 Hz, which is obviously not an option in a real world scenario. Maybe it's possible to do, but for my use case, 2 DP + internal laptop screen is good enough. For anything more, some USB DisplayLink graphics card will do the job. My setup uses a lot of these ports: Two Monitors (2560x1440 @ 60 Hz resolution) via DisplayPort and mini DisplayPort, Gigabit Ethernet, USB 3.0 to a Hub, both Audio Outputs, and occasionally an external USB 3.0 Hard Drive. It all connects to the laptop with a single cable, just as promised. And that includes charging, so no need for the laptop power supply. Performance-wise, it's pretty satisfactory. 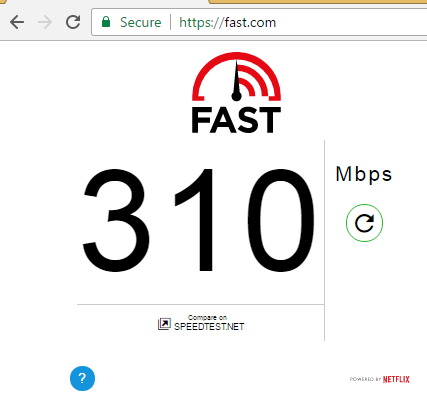 The Ethernet port gets about 70 MB/s (Update: I've seen higher speeds, up to 100 MB/s, so I guess my home server is the bottleneck), and I can make full use of my 300 MBit/s internet connection (humblebrag), something I couldn't do with Wireless. My external hard drive gets 110 MB/s - since it's a 2.5" rotary drive, that might be the limitation of the drive. I haven't tried with two 4K Monitors, but my 2560x1440 screens have no issues with flickering or else. Copying directly from a network share to the USB 3.0 drive also works fine at the same speed (~70 MB/s) without disturbing the monitors. Make sure to go to Dell's support site and download the latest BIOS, Intel Thunderbolt Controller Driver and Intel Thunderbolt 3 Firmware Update, along with the USB Ethernet, USB Audio and ASMedia USB 3.0 Controller drivers. It's absolutely necessary to do this, since older firmware and driver versions have a lot of issues. FWIW, I'm running 64-Bit Windows 8.1 and everything works perfectly fine - I haven't tested on Windows 10, but assume it'll be fine there as well. It took way too long and required a lot of patches - but now that it's here and working, I can say that the TB16 is everything Thunderbolt promised. 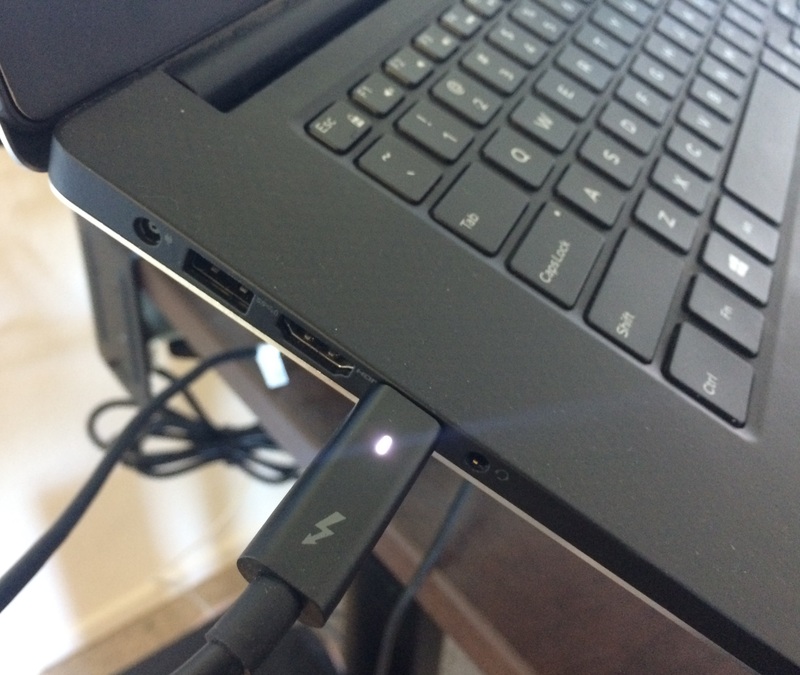 It's expensive, but if Thunderbolt stops changing connectors with every version, I can see the dock lasting a long time, on many future laptops. Here's a few git settings that I prefer to set, now that I actually work on projects with other people and care for a useful history. git config --global branch.master.mergeoptions "--squash"
This always squashes merges into master. I think that work big enough to require multiple commits should be done in a branch, then squash-merged into master. That way, master becomes a great overview of individual features rather than the nitty-gritty of all the back and forth of a feature. This always rebases your local commits, or, in plain english: It always puts your local, unpushed commits to the top of the history when you pull changes from the server. I find this useful because if I'm working on something for a while, I can regularly pull in other people's changes without fracturing my history. Yes, this is history-rewriting, but I care more for a useful rather than a "pure" history. Combined with git repository hosting (GitLab, GitHub Enterprise, etc. ), I found that browsing history is a really useful tool to keep up code changes (especially across timezones), provided that the history is actually useful. Setting up IIS usually results in some error (403, 500...) at first. Since I run into this a lot and always forget to write down the steps, here's my cheatsheet now, which I'll update if I run into additional issues. Give IIS_IUSRS Read permission to the folder containing your code. If your code modifies files in that folder (e.g., using the default identity database or logging, etc. ), you might need write permissions as well. 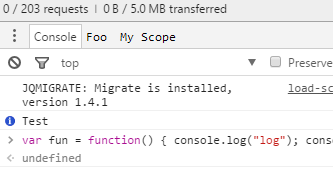 Can we build a better console.log? From there, we can even think about stuff like "Write all log messages with this scope to a file" and then I could browse the site, test out functionality and then check the logfile afterwards. Of course, there are a few issues to solve (Do we support child scopes? Would we expose sinks/output redirection via some sort of API? ), but I think that it's time to have a look at how to turn the console.log mechanism from printf-style debugging into something a lot closer to a dev logging facility. This is a bit of a follow up to my 3 year old post about LINQ 2 SQL and my even older 2011 Thoughts on ORM post. I've changed my position several times over the last three years as I learned about issues with different approaches. TL;DR is that for reads, I'd prefer handwritten SQL and Dapper for .Net as a mapper to avoid having to deal with DataReaders. For Inserts and Updates, I'm a bit torn. I still think that L2S is a vastly better ORM than Entity Framework if you're OK with solely targeting MS SQL Server, but once you go into even slightly more complex scenarios, you'll run into issues like the dreaded SELECT N+1 far too easily. This is especially true if you pass around entities through layers of code, because now virtually any part of your code (incl. your View Models or serialization infrastructure) might make a ton of additional SQL calls. The main problem here isn't so much detecting the issue (Tools like MiniProfiler or L2S Prof make that easy) - it's that fixing the issue can result in a massive code refactor. You'd have to break up your EntitySets and potentially create new business objects, which then require a bunch of further refactorings. I have one or more classes that end in Repository and it's these classes that implement the database logic. If I need to call the database from my MVC Controller, I need to call a repository. That way, any database queries live in one place, and I can optimize the heck out of calls as long as the inputs and outputs stay the same. I can also add a caching layer right there. If I have a specialized business type (say AccountWithBalances), then that's what the repository exposes. I can write a complex SQL Query that joins a bunch of tables (to get the account balances) and optimize it as much as I want. There are scenarios where I might have multiple repositories (e.g., AccountRepository and TransactionsRepository), in which case I need to make a judgement call: Should I add a "Cross-Entity" method in one of the repositories, or should I go one level higher into a service-layer (which could be the MVC Controller) to orchestrate? But regardless how I decide on where the AccountWithBalances Getter-method should live, the one thing that I'm not going to do is exposing a hot database object. Sure, it sounds convenient to get an Account and then just do var balance = acc.Transactions.Sum(t => t.Amount); but that will lead to 1am debugging sessions because your application broke down once more than two people hit it at the same time. At the end, long term maintainability suffers greatly otherwise. It seems that it's more productive (and it is for simple apps), but once you get a grip on T-SQL you're writing your SQL Queries anyway, and now you don't have to worry about inefficient SQL because you can look at the Query Execution Plan and tweak. You're also not blocked from using optimized features like MERGE, hierarchyid or Windowing Functions. It's like going from MS SQL Server Lite to the real thing. So raw ADO.net? Nah. The problem with that is that after you wrote an awesome query, you now have to deal with SqlDataReaders which is not pleasant. Now, if you were using LINQ 2 SQL, it would map to business objects for you, but it's slow. And I mean prohibitively so. I've had an app that queried the database in 200ms, but then took 18 seconds to map that to .net objects. That's why I started using Dapper (Disclaimer: I work for Stack Overflow, but I used Dapper before I did). It doesn't generate SQL, but it handles parameters for me and it does the mapping, pretty fast actually. If you know T-SQL, this is the way I'd recommend going because the long-term maintainability is worth it. And if you don't know T-SQL, I recommend taking a week or so to learn the basics, because long-term it's in your best interest to know SQL. But what about Insert, Update and Delete? Another thing that requires you to use raw SQL is Deletes. E.g., "delete all accounts who haven't visited the site in 30 days" can be expressed in SQL, but with an ORM you can fall into the trap of first fetching all those rows and then deleting them one by one, which is just nasty. Concluding this, there are good reasons to use ORMs for developer productivity (especially if you don't know T-SQL well) but for me, I'll never touch an ORM for SELECTs again if I can avoid it. I have a custom DNS Server (running Linux) and I also have a server running Linux ("MyServer"). The DNS Server has an entry in /etc/hosts for MyServer. On my Windows machines, I can nslookup MyServer and get the IP back, but when I try to access the machine through ping or any of the services it offers, the name doesn't resolve. Access via the IP Address works fine though. What's interesting is that if I add a dot at the end (ping MyServer.) then it suddenly works. What's happening?! What's happening is that Windows doesn't use DNS but NetBIOS for simple name resolution. nslookup talks to the DNS Server, but anything else doesn't use DNS. The trick was to install Samba on MyServer, because it includes a NetBIOS Server (nmbd). On Ubuntu 16.04, just running sudo apt-get install Samba installs and auto-starts the service, and from that moment on my Windows machines could access it without issue. There are ways to not use NetBIOS, but I didn't want to make changes on every Windows client (since I'm using a Domain), so this was the simplest solution I could find. I still needed entries in my DNS Server so that Mac OS X can resolve it. As Nick Craver explained in his blog posting about our deployment process, we deploy Stack Overflow to production 5-10 times a day. Apart from the surrounding tooling (automated builds, one-click deploys, etc.) one of the reasons that is possible is because the master-branch rarely ever stays stale - we don't feature branch a lot. That makes for few merge-nightmares or scenarios where suddenly a huge feature gets dropped into the codebase all at once. The thing that made the whole "commit early, commit often" principle click for me was how easy it is to add new feature toggles to Stack Overlow. Feature Toggles (or Feature Flags), as described by Martin Fowler make the application [use] these toggles in order to decide whether or not to show the new feature. The Stack Overflow code base contains a Site Settings class with (as of right now) 1302 individual settings. Some of these are slight behavior changes for different sites (all 150+ Q&A sites run off the same code base), but a lot of them are feature toggles. When the new IME Editor was built, I added another feature toggle to make it only active on a few sites. That way, any huge issue would've been localized to a few sites rather than breaking all Stack Exchange sites. Feature toggles allow for a half-finished feature to live in master and to be deployed to production - in fact, I can intentionally do that if I want to test it with a limited group of users or have our community team try it before the feature gets released network-wide. (This is how the "cancel misclicked flags" feature was rolled out). But most importantly, it allows for changes to constantly go live. If there is any unintended side-effects, we notice it faster and have an easier time locating it as the relative changeset is small. Compare that to some massive merge that might introduce a whole bunch of issues all at once. I wasn't around when that feature was built and don't know how much effort it took, but it was totally worth building it. If I don't want a feature to be available, I just put it behind a setting without having to dedicate a bunch of time to wire up the management of the new setting. Feature Toggles. Use them liberally, by making it easy to add new ones.